“You have got to be Chris’ dad!” is something I’ve heard a lot this week. 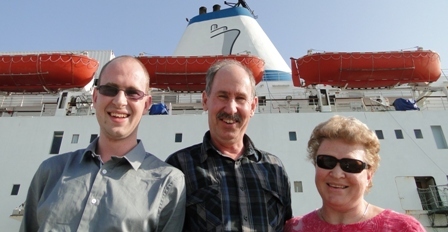 You see my Dad and I look almost identical, give or take a few years – so it would be impossible for me to hide the fact that my parents have been staying on board Logos Hope this week. After spending a week onshore getting some much needed R&R and spending quality time with my parents, this week I am back to work. In fact this week I am starting as the leader of the AV team. You may remember that I was the team leader some months ago until the opportunity for someone more experienced and gifted with team leading could take the burden from me for a while. Catherine has done a magnificent job of bring us together as a team and sorting out scheduling and logistics and I hope that I have learned well from her example. I also feel that I have good support now from my supervisors and from my team as well. Please pry that I would be a good team leader, always looking to the needs of my team. While my parents have been on board my Dad got a taste of what it is like to work in the AV team, and boy did we work hard. Dad helped me to set up all new music stands and a lectern for the main meeting room. He was also able to re-string a guitar that had been disused for some time – and now it sounds great! 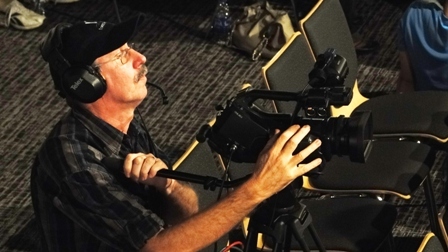 One night he had the opportunity to work with a larger team as a camera man for a youth event. Packed with over 400 youth from fellowships the event was a great success. All in a day’s work for the AV team.